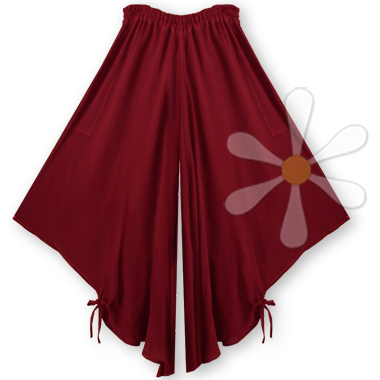 What if your pants were as flowy as a skirt? The comfort factor is just one of the many charms of this deliriously soft garment, handmade in Morocco of the most delicious susdi -- a cotton/rayon blend that we've coined 'the cashmere of cottons'. When you feel it, you'll understand! The Norah feature our as-ever comfy elastic waist and handsomely topstitched pockets. They're cut to a kind of diamond shape, which is wider and shorter at the sides, longer on the inseam. About halfway along the hem of each leg is a pattern-cut tie that can be used to gather in and tame the wide openings... another example of Moroccan design magic!